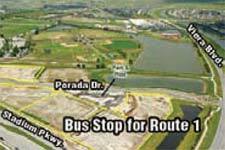 The Viera Park & Ride lot is located on Porada Drive in Viera in Brevard County, Florida. This facility is privately owned and maintained by the Viera TMA. The lot is open to the public, providing users an impeccably maintained facility in close proximity to I-95 and Space Coast Stadium. The lot is a great location to meet and share your commute to regional work centers like Orlando or Kennedy Space Center. Employers save money by encouraging employees to use Park & Ride lots as it reduces the need to provide expensive on-site parking. Employers can also save money on payroll taxes by providing employees tax-free transit and vanpool benefits. For more information, call 321-952-4563 or E-mail us!